Ground floor, end unit condo located in a gated family community, approximately one mile from the beach, and in an intracoastal waterway community. NO MOTORCYCLES. Just minutes from North Myrtle Beach Sports Complex. Property has 2 bedrooms/2 bathrooms and is fully furnished. SLEEPS SIX. Master bedroom has queen size bed and private bathroom and flat screen tv, guest bedroom has a queen size bed and flat screen tv. Living room has pullout couch queen sleeper sofa. Living room also has flat screen tv and futon sleeper sofa. All TVs have Time Warner Cable and WiFi internet. 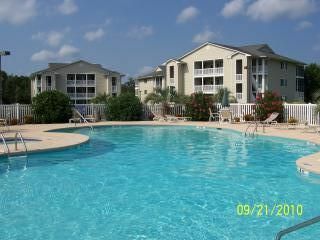 Great for adult vacationer who loves beach atmosphere in a quiet community without the hassle of overcrowding. Ground floor makes it attractive to seniors. This vacation home is our second home and is furnished & decorated as such. We only rent to adults and families OVER 30 years of age. We use this home 15 weeks per year with family and we rent it just to defray some of our yearly costs. Dave and Nancy Forrester enjoy visiting this vacation condo with family every chance they get. This property is close enough to all that is going on at the Grand Strand and yet is quiet at the end of the day being a gated community with two pools and outdoor decks on the coastal waterway. Outdoor picnic tables with grills located through out the community. We have many family guests come every year that participate in the North Myrtle Beach softball tournaments just minutes from condo. Large parking lot in front of main entrance. Time Warner Cable with internet. Has a sleeper queen sofa and lift chair plus one lazy boy chair. A futon that is a double bed for small guests or one adult. A flat screen Tv. Side by side with filtered water dispenser. Kitchen is fully stocked to serve a minimum of eight place settings. One flat screen in living room and master bedroom. Time Warner Cable with WiFi.. In living room and master bedroom. Pictures show 5 decks on waterway that can be enjoyed for fishing and picnicking by all guests of the community. Two outdoor pools to be enjoyed by all guests in the gated community. Located at main pool area. Condo offers sunroom with sliding glass windows, seven piece dining room set, washer/dryer, dishwasher, refrigerator, range, microwave oven, coffee maker, wifi, dishes/utensils, 3 Cable TVs, 2 fenced in pools, and plenty of parking spaces. Five waterway piers can be used by friends and guests for viewing or fishing the intracoastal waterway. Wireless internet available. Guests provide own towels and linens for beds. Came to Myrtle Beach for one of our daughters softball tournament. For a family of 6 finding a good affordable place was tough. We were extremely lucky to find this place, it was perfect. Close to the beach, the ball fields, and everything else. Condo had plenty of room, clean, and all the basics and more ready. Owner is extremely nice and great communication!! Definitely sharing this place with others and keeping in mind for another vacation. All the way around one of the best vacations we have had. Highly recommend!!!!! Thank you so much Dave!!! SOS at North Myrtle + Waterway Landing = Three Days of Smiles! The condo was perfect for "spring break for old people" event. We loved it! Thank you for choosing to stay with us. Come back anytime. I appreciate your review. We had a great time! Perfect weather and so much to do! Condo was awesome and a steal! Dave was wonderful and super accommodating the entire time. Will def stay here again next time. We found our home away from him in N. Myrtle Beach! Located less than 10 minutes from Barefoot Landing, House of Blues, and Alabama Theater. Fine dining, golf courses, nightlife, and recreational activities are only minutes away. Myrtle Beach Airport is located approximately 30 minutes south on Hwy 17 bypass, with easy access to all major roads and bypasses. Plenty of shopping centers and grocery stores located within minutes. Nightly Rate: $100 - $140 Weekly Rate: $600- $780 Monthly Rate: $1,150 Winter All of the above rates are weekly rates. $200.00 dollar non-refundable deposit required in advance to reserve a week.